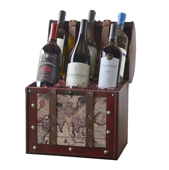 Get them outta here...I am not moving these beautiful Treasure Chests filled with my favorite wines...I would rather sell them cheap then palletize, load and deliver to our new location. OMG...here is the deal...Everything is 50% OFF...half price! ½ off...say it how you want...it comes to 50% off. We are moving in three weeks...so that is it...you have till sold out to get yours...at these prices, just send one...anywhere to anyone.